I love banana bread. I've made it from a lot of different recipes, and I've created my own recipes as well. So when I got a review copy of The Cook's Illustrated Cookbook, the banana bread recipe was on my short list. I wanted to make it immediately, but there was one thing that forced me to wait. I mean, seriously, when I buy banana to eat, they turn brown as soon as I turn my back on them. And then I bake with them. When I bought bananas specifically to make banana bread, it seemed like it took forever for them to get to that perfect stage of over-ripeness. Since this was a Cook's Illustrated recipe, I wasn't about to shortchange it by using bananas that weren't up to par. Or maybe down to par, in this case. I was pleased to see that the recipe used weights for ingredients that can vary when you use volume or "per piece" measurements. It was nice to be able to weigh the flour, brown sugar, and bananas, and know that I had exactly what they asked for. 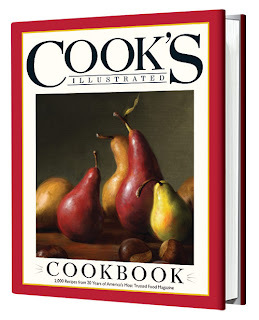 For fans of Cooks Illustrated, this is the ultimate cookbook. It's got recipes from 20 years worth of the magazine - 2000 recipes in all. I didn't count them - that's what the press kit said. And here's a fun bit of trivia for you - the test kitchen for the magazine spends $523,000 per year on groceries,and there are two full-time staff members who shop for those groceries. That's a lot of food. Cooks Illustrated Magazine is nothing if not quirky. It's got its own personality. Look at the magazine cover and if you couldn't read the words, you'd still know it's CI. The cookbook follows through. If the cover photo wasn't from one of the magazines, it certainly could have been. These days, cookbooks tend to have fewer recipes and big full-color photos that make you drool. But this one continues with the CI style of having what looks like pencil drawings for illustrations. It's not a tabletop book that you browse through, it's a workbook. 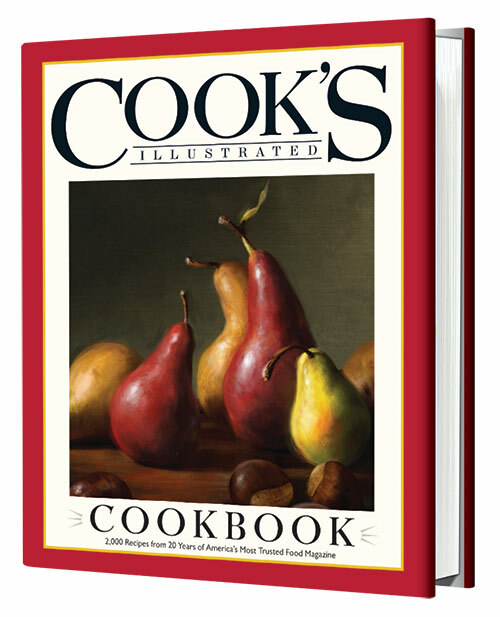 Over the years, I've cooked a number of recipes from Cook's Illustrated and America's Test Kitchen. Sometimes I grumble a bit at some of the fussiness of the recipes. But when the food's done, I'm always happy with the results. Will I throw away all my other cookbooks? Well, no. But this is going to be an interesting one to work with. It'll be a great one to turn to when I'm making - or messing with - classic recipes. This is a book that had its own fan base as soon as it was published. People who have back issues of the magazine squirreled away will be able to get rid of those and just have one book. One hefty, heavy book. It's a bit of a monster, that's for sure. And CI fans who don't have all those copies squirreled away will love the idea that they can have the entire collection in one book. Well, okay, it's not every recipe, ever. Some recipes were re-done and re-worked over the years, so this book only has the newest and the best. But come on, it's 2000 recipes. I think that's enough for anyone. Speaking of one - you want one, right? Here's the banana bread I promised you. Be sure to use very ripe, heavily speckled (or even black) bananas in this recipe. This recipe can be made using five thawed frozen bananas; since they release a lot of liquid naturally, they can bypass the microwaving in step 2 and go directly into the fine mesh strainer. Do not use a thawed frozen banana in step 4; it will be too soft to slice. Instead, simply sprinkle the top of the loaf with sugar. We developed this recipe using a loaf pan that measures 8 1/2 by 4 1/2 inches; if you use a 9 by 5‑inch loaf pan,start checking for doneness 5 minutes earlier than advised in the recipe. The texture is best when the loaf is eaten fresh, but it can be stored (let it cool completely first), covered tightly with plastic wrap, for up to 3 days. Adjust oven rack to middle position and heat oven to 350 degrees. Spray 81/2 by 41/2‑inch loaf pan with vegetable oil spray.Whisk flour, baking soda, and salt together in large bowl. Place 5 bananas in separate bowl, cover, and microwave until bananas are soft and have released liquid, about 5 minutes.Transfer bananas to fine-mesh strainer over medium bowl and allow to drain, stirring occasionally, for 15 minutes (you should have 1/2 to 3/4 cup liquid). mostly smooth. Whisk in butter, eggs, brown sugar, and vanilla. Pour banana mixture into dry ingredients and stir until just combined, with some streaks of flour remaining. Gently fold in walnuts, if using. Scrape batter into prepared pan. Slice remaining banana diagonally into 1/4‑inch-thick slices. Shingle banana slices on top of loaf in 2 rows, leaving 11/2‑inch wide space down center to ensure even rise. Sprinkle granulated sugar evenly over loaf. Bake until toothpick inserted in center of loaf comes out clean, 55 to 75 minutes. Let loaf cool in pan for 10 minutes, then turn out onto wire rack and let cool for 1 hour before serving. 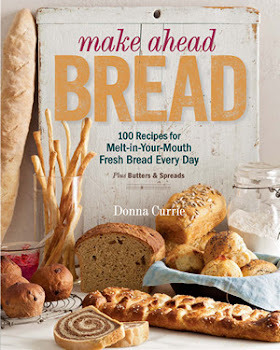 I have this book and this bread has been on my to-bake list :-) Your loaf looks great!! Donna, you never actually said how this recipe stacks up to others. What was your verdict? New Best Recipe is the most frequently referenced book in my kitchen, and I appreciate the angle from which the look at recipes; trying to tweak technique and ingredients to get the best possible result in the home kitchen. That being said, I wasn't blown away by this bread. I made it this morning and can't really see what the advantage of reducing the strained liquid confers. This bread, in my humble estimation, was only okay. I did like the way that you suggested to shingle the banana slices as I hadn't seen that before. Also, I substituted turbinado for granulated sugar for the crunch factor. Overall, I probably will move on from this recipe. Okay, but not stupendous. Thank you for posting this recipe. I will own the book someday, but until I do...your sharing will do. This is my favorite banana bread recipe ever. I've made it several times and it is delicious every time. My only modification is that I leave off the bananas on the top. They're too rubbery. Susan, I thought the bananas on top looked interesting, but they didn't need to be there. Yum, wow, I'm still tasting the banana bread in my mouth. As always, recipes from Cooks Illustrated are a labor of love, but well worth it in the end. I had a ton of "banana water" after putting them in the sieve. I probably should have cooked the water down to more of syrup, because when the bread was done, I could see towards the bottom how the excess liquid collected and made it more dense. But the flavor was astonishing. I deleted the walnuts, just to save on some calories. I also used a European butter, which made the bread taste more like butterscotch. I cut the top banana on the bias, so it looked quite pretty. I mis-read the instructions to put the granulated sugar over the whole loaf. I just sprinkled it on top of the bananas. But talk about gilding the lily. YUM. Cookbooks - can you have too many? Who got the Abrams Books from Virtual Potluck? Would YOU like your very own fresh white truffle? Whole Foods Friday: It's Salad. Or is it? Whole Foods Friday: Lasagna Night! Peanut Butter and Banana ... Cupcakes!